What is a CO2 incubator? Inside a CO2 incubator, also known as a gassed incubator, an atmosphere is created that is as natural as possible to develop cell and tissue cultures. This way of cultivating living organisms is called in vitro and is the main application for CO2 incubators. The process can take several weeks, during which sample growth and safety are always the top priority. To guarantee both these aspects, the temperature, humidity, and CO2 content must match the cell culture requirements as precisely as possible. A CO2 incubator has an interior which is completely sealed off from the environment to ensure the atmosphere inside the unit cannot be affected by external factors. To enable laboratory technicians to still view the samples during the growth phase, most CO2 incubators feature a glass door as well as the regular door, which provides additional protection against contamination. The interior is made of rust-resistant materials such as stainless steel and should have as few sharp edges and grooves as possible to avoid any places where contamination could be hidden. In the sensitive field of cell cultivation in particular, just one single germ can ruin weeks of work. The air coming in flows through a sterile filter and must be distributed evenly throughout the whole interior, as the samples are usually positioned on shelves at different heights. The challenge lies in creating homogeneity through the entire interior, to ensure a uniform supply of CO2 for all samples at constant climate and humidity conditions. CO2 incubators are most frequently used in medical research and the pharmaceutical industry. However, they also provide sterile conditions for cultivation in other fields where cells must grow in a completely germ-free environment. We have provided a summary of other possible applications in the blog post "Five exciting applications for CO2 incubators". Or just take a look at our case studies! Tissue engineered products are medical products specifically developed for novel treatments. With these new types of treatment, scientists hope to cure previously incurable diseases such as serious malignant tumors or cardiovascular failure. CO2 incubators are used to cultivate cell and tissue cultures in the research, development, and quality assurance of these products. As part of research into lipid-based gene therapy on a human skin model, BINDER CO2 incubators were used to isolate epidermal keratocytes, in neutral red tests, and to prepare epidermal keratinocytes for transfection. Cells for cell therapy are produced in authorized centers. They are processed by CO2 incubators in class C clean rooms. The Swiss Center for Regenerative Medicine (SCRM) at the University of Zurich uses CO2 incubators to research therapies based on tissue engineering, i.e., the cultivation of tissue and cell clusters. This enables living tissue such as heart valves and blood vessels to be grown from stem cells in the laboratory. In vitro fertilization (IVF) describes a method of artificial fertilization used in human reproductive medicine. This application aims to fuse an egg and sperm cell together in a petri dish along with a cell culture medium. The human embryos then start to fertilize and develop in a CO2 incubator, before being transplanted into the uterus after two to three days. Optimal conditions in the incubator chamber are approximately 37°C, 5 or 6 vol. % CO2, and humidity of around 95%. Staff label the petri dishes very precisely to avoid mix-ups. The inner glass doors of the CO2 incubators mean the dishes can be monitored at all times too. The process is similar in veterinary medicine, for example with cattle. The oocytes are put into a petri dish together with the sperm and, during an incubation period of 21 hours, the sperm fertilize them. On the eighth day after fertilization, the embryos are transferred from the CO2 incubator into the recipient animals. The study of cell cultures plays a crucial role in the diagnostic analysis of pathogens. The results obtained from such investigations enable precise proof of hygiene levels to be formulated, and the degree of biopharmaceutical resistance to viruses to be evaluated. One method often used in this context is the swipe sample, where cell cultures which are susceptible to viruses are exposed to them in order to test their biological function. CO2 incubators are the right tool for the various process steps involved, such as thawing and transferring the cells, as well as infecting the cell lines and dyeing the cell cultures. During this application, conditions in the interior are usually set to 37°C and 5 vol. % CO2. The samples are analyzed after 72 hours at the latest. The blue coloration of the cell layer makes it possible to characterize the plaque in more detail either with the naked eye or under a microscope. 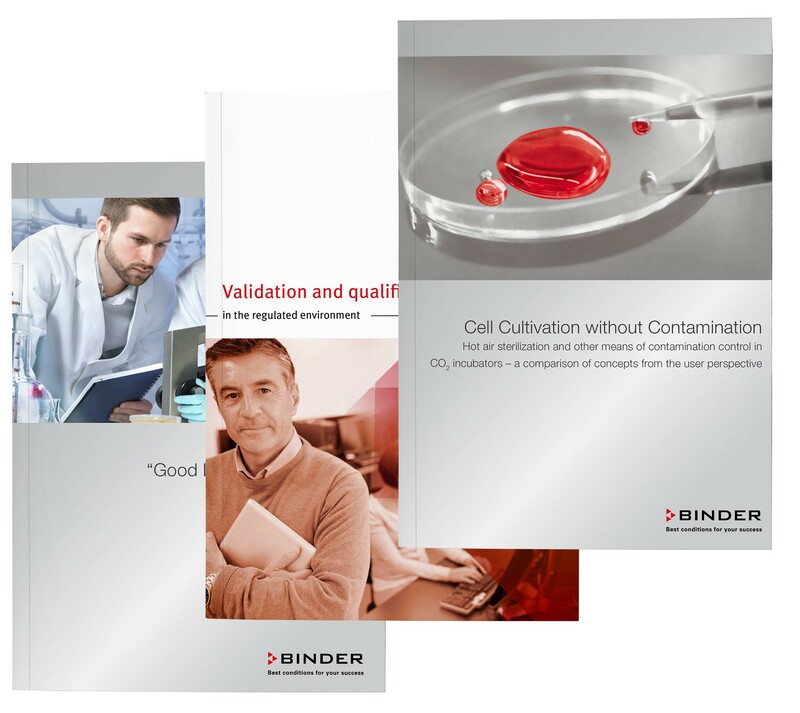 BINDER CO2 incubators are particularly good for diagnostic purposes or virus identification, since they maintain extremely stable incubation conditions. Inner glass doors for segmented access help here too. What's more, the risks of cross-contamination and the silent spread of contamination are reliably eliminated at all times thanks to automatic hot-air sterilization at 180°C. Biosensors are cropping up more and more in fields such as medicine, fermentation monitoring, food quality control, and environmental analysis. A biosensor converts a biologically sensitive element into a digital signal, which in turn can be used to perform analyses by means of physical or chemical stimulation. Cellular in vitro systems combined with sensors are used in the pharmaceutical industry, toxicology, and basic research. One of the most well-known examples are the enzyme sensors used to measure glucose. An impressive example: cardiomyocytes from embryonic hens were reaggregated in a rotation culture into spheroids (3D architecture) and connected to microelectrodes. Reference substances were used to test the extent to which statements could be made about applying a stimulus to a living system. The spheroids were produced in petri dishes in CO2 incubators at 37°C, 5 vol. % CO2, and 72 rpm and 20 mm orbit. As the American Association for Cancer Research AACR18 showed so emphatically in 2017, enormous progress has been made in the field of cancer research. CO2 incubators play an important role in preparing samples and tests in all areas of cancer research such as drug research and the development of 3D invasions, assays, and biosensors – from a simple monolayer through to the reproduction of patient tumors by means of 3D cell culture models (drug research and development of treatments). In the fields of immunology and tumor biology (how malignant tumors develop), CO2 incubators are used at 37°C, 5 vol. % CO2, and 95% relative humidity under normoxic conditions, as well as CO2/O2 incubators at 37°C, 5 vol. % CO2, and hypoxic 1 vol. % O2, depending on the cell cultures involved. In clinical research, for example, that into oncogenes and tumor suppressors, CO2 incubators are used at 37°C and 5 vol. % CO2 under normoxic conditions. The American Association for Cancer Research AACR's mission is to prevent and cure cancer through research, continuing education, communication, and cooperation. In this case study, you can read about how you can ensure maximum sample safety and minimum risk of contamination. This case study looks at how human skin cell cultures are incubated and at homogeneous CO2 distribution in the incubator. This case study highlights solutions for reproducible growth conditions and a low risk of contamination. In this case study, you can read about how you can ensure cell tissue is cultivated safely and efficiently, while making maximum time and cost savings. Fill out the form to receive the case studies free of charge. Various guidelines regulate how CO2 incubators must be handled. In the pharmaceutical industry, the requirements of Good Laboratory Practice (GLP) and Good Manufacturing Practice (GMP) are described in 21 CFR Part 11. They regulate how to handle measuring instruments, which must be calibrated and tested at specific intervals. A data logger must record all test parameters and forward them to the software and the storage medium, where they are processed and archived. 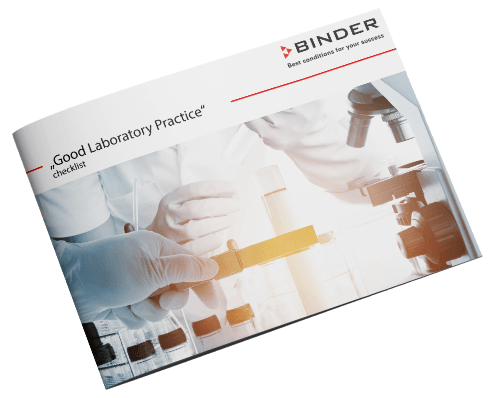 You will find all tips and tricks surrounding GLP in our whitepaper: "Good Laboratory Practice" – What is behind all this? From what point is a CO2 incubator ready for use? Installation Qualification (IQ): In the first step, the function of all the components of the CO2 incubator is tested. Operational Qualifications (OQ): In this step, the performance of the CO2 incubator is tested with the chamber empty. This is to answer the question of whether a specific temperature range can be adhered to and whether the data logger has been calibrated correctly. Performance Qualifications (PQ): This step determines whether the incubator is capable of maintaining the temperature level when loaded too. What does GLP mean for incubators, climate chambers, and vacuum drying chambers? What specific steps can be taken to implement it? What factors need to be considered? What forms of evidence and documentation are required? And what solutions can BINDER provide in order to help you comply with GLP guidelines? Our "Good Laboratory Practice" checklist aims to answer these burning questions. As well as this, it outlines key unit-related GLP criteria. Fill out the form to receive the checklist free of charge! Contamination prevention – Which measures are in place to prevent any risk of contamination? Use – What is the ideal design for a CO2 incubator to ensure that it is user-friendly? Design of the interior – What ae the features of a well-designed unit? Humidity management – What is the best way to stop cell cultures from drying out? CO2 supply – What is the safest and most effective way to supply CO2? A lack of places where contamination can be hidden, such as fans and grooves in the incubator interior. Rounded edges and corners that enable disinfectant to be sprayed on and wiped off with ease. The option to perform full hot-air sterilization throughout the interior. You can find out more about the risks of contamination in this blog post. Intuitive navigation makes processes simpler and ensures there are no barriers hindering work. It is also important that CO2 incubators are easy to dismantle, as they have to be cleaned and reloaded on a regular basis. The time needed for this process can vary between manufacturers. When it comes to the interior, less is more: it should be simple, clear, easy to clean, and low-maintenance. 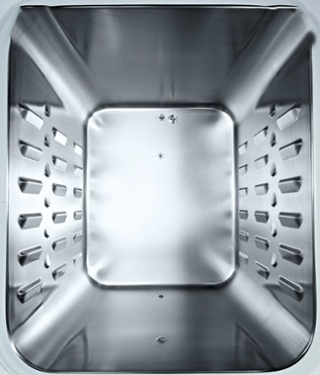 Potential contamination surfaces must be kept to a minimum in order to guarantee the best possible growth conditions for cell and tissue cultures. Hot-air sterilization should be easy to perform at the press of a button. In order to comply with standards, it should be possible to decontaminate the entire interior at 180°C. Having an environment that is sufficiently humid will prevent cell cultures from drying out. A smart humidity management system ensures that humidity levels are high, with evaporation of the medium kept to a minimum and, where possible, no risk of contamination. The aim here is to achieve completely homogeneous gas distribution in the interior. A suitable CO2 supply system is one that guarantees a steady pH value in the incubation chamber at all times so as to provide the ideal conditions for cell growth. A CO2 sensor with a clever design reacts quickly to changes in the gas concentration, thereby ensuring it is stable in the long term. CO2 incubators are available with their CO2 sensor either outside or inside the incubation chamber. On that basis, the sensor should be located inside the incubation chamber, but it is essential that it is also protected against high temperatures. 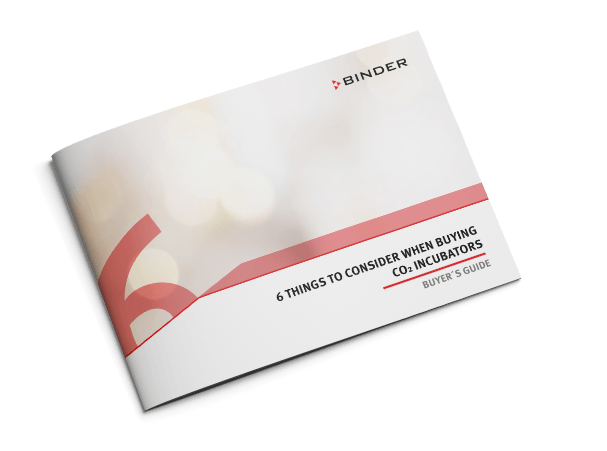 We have summarized everything you need to bear in mind before purchasing a CO2 incubator in six points in our Buyer's Guide. CO2 incubators are designed to create the best possible conditions for cell cultures in investigations and prevent any potential contamination. CO2 incubators are available with various exterior and interior dimensions, as well as different temperature, humidity, and CO2 values. You should always analyze the applications you need the CO2 incubator to carry out in advance. But in every case, a CO2 incubator should reliably prevent contamination, keep the pH value in the interior stable, and demonstrate a high level of temperature precision. Contamination is a universal problem when working with cell cultures. Preventing contamination requires the use of sterile methods as well as careful handling of cultures. The CO2 incubator also plays an important role because it provides not only cell cultures but also many undesirable microbes with ideal growth conditions. Accordingly, every high-quality CO2 incubator offers several features for preventing contamination. A judicious decision for the purchase of a CO2 incubator cannot, however, be made exclusively on the basis of the sum of its technical details. Instead, the overall systems and, in particular, the anti-contamination designs must be compared and evaluated. 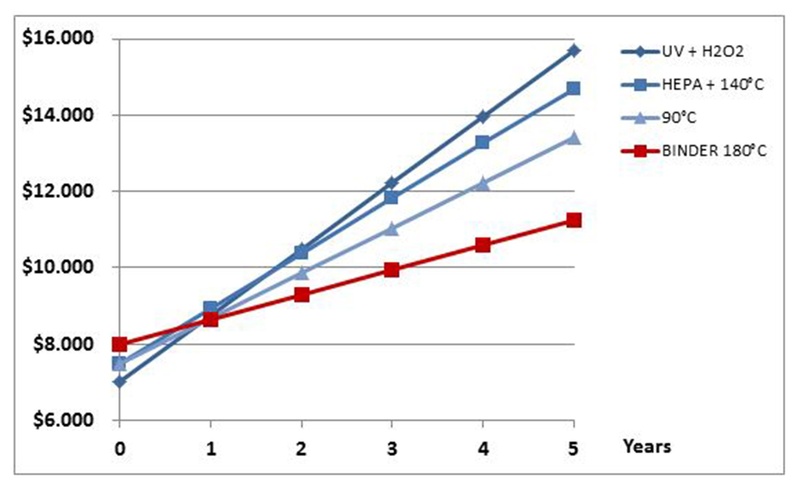 This shows that complex systems are not intrinsically more safe than simple ones. It should be possible to reliably prevent contamination with the unit with speed and ease but without incurring high costs for consumables. You will find more information on hot-air sterilization and other contamination control measures in CO2 incubators in the whitepaper "Cell cultivation without contamination"! CO2 incubators with additional process control will be required for complex cultivation experiments or individual growth environments, such as under hypoxic conditions. They will provide the features necessary to perform even difficult incubation tasks with aplomb. Learn about the different versions here! 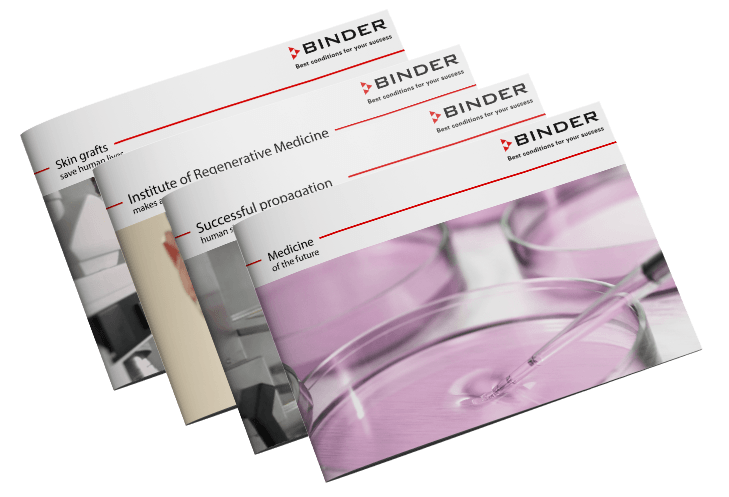 BINDER – Quality pays for itself! Simple cleaning saves time and money: it can take between one and a whole five minutes to clean various CO2 incubators properly, and this can have a huge impact on personnel costs if multiple units and short loading intervals are involved. Consumables can also be a decisive cost factor, as they can be as high as €1,500 per year for some manufacturers. Keep your running costs low by choosing a CO2 incubator that has no need for consumables. It is only possible to determine whether buying a particular unit model will still be a worthwhile investment after years of use by factoring in the running costs. "Good Laboratory Practice": What is behind all this? In this whitepaper, you can read about why the four eyes principle is so crucial during the approval process and how important it is to submit all documents in full. This whitepaper also explains the role played by computer-supported systems during qualification and how the process works in detail. This whitepaper compares and evaluates the overall systems and, in particular, the anti-contamination designs. Fill in the form and get the free whitepaper! Choose the right CO2 incubator for your application! It is essential that the atmosphere in a CO2 incubator is precisely maintained in order to protect the samples as effectively as possible. The material loaded into the incubator is always valuable and test phases are usually lengthy. Therefore, the quality of the CO2 incubator is incredibly important. One more thing to bear in mind: you must clean the CO2 incubator properly before every new test to exclude the possibility of any cross-contamination of the new samples. This means your unit should be easy to clean. It is just as important that your CO2 incubator functions without creating any condensation whatsoever and creates the optimum growth conditions for your cultures. If you take all these criteria into account, you will be sure to find the right CO2 incubator for your application! Do you have questions about a particular product? Our expert team will be happy to advise you!